Vintage Girl: skirt and matching wallet! 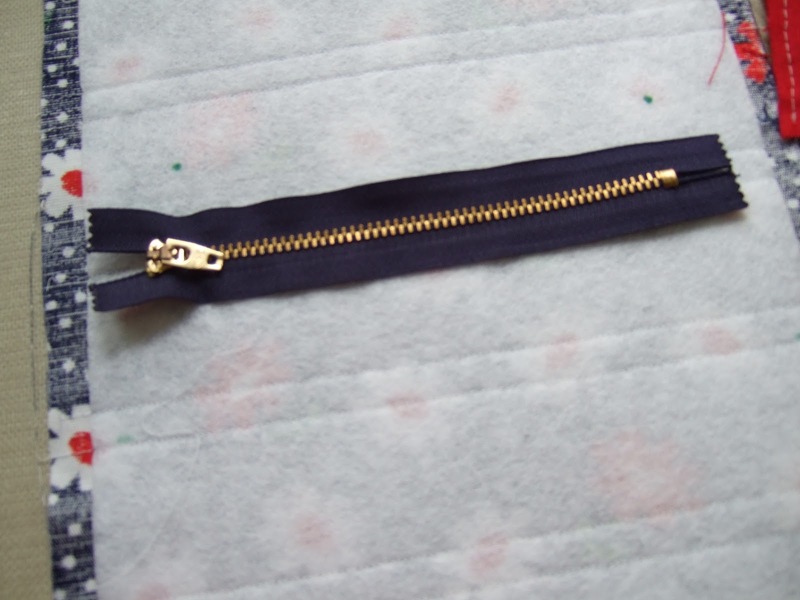 There were some sketchy instruction on the internet way back when on how to make your own wallet. So, I tried it, as I look at this wallet now, I just marvel at the fact that I made it years ago with no pattern. It was "drafted" to this size and shape. I added three slots for dividing my money into budgets of groceries, clothes and entertainment. The zippered slot was inserted for my loose change and card holders for my various cards. Over the years, I have enjoyed carrying this homemade wallet. The idea for it was based off of the Dave Ramsey's Financial Peace Institution. Well, today as I was going through my stash, I found two yards of the vintage fabric that was long forgotten from this wallet project. I knew it was time to make something with it. There wasn't enough for a dress but I could see a matching skirt in my future. I really like how this skirt came together. It was made from mixing three different patterns. I am discovering pockets, can you tell? Now that I understand that pockets can be a friend to the fuller hipped gal, I have put them on a few of my garments. The fabric of this skirt is heavy, almost like a denim, I love it. I couldn't resist adding some cute piping again. I am also really happy with the fit of this little number, often times when buying RTW skirts they pull at my lower hip and are tight. With vintage skirt patterns most times I have enough lower hip room and don't need to adjust them much. I do not have a proper blouse for this skirt yet, any ideas for a style? I would like a button down, I think. Anyway, I have been sewing and have a lot to share with you this week! The pockets on the skirt are so cute! 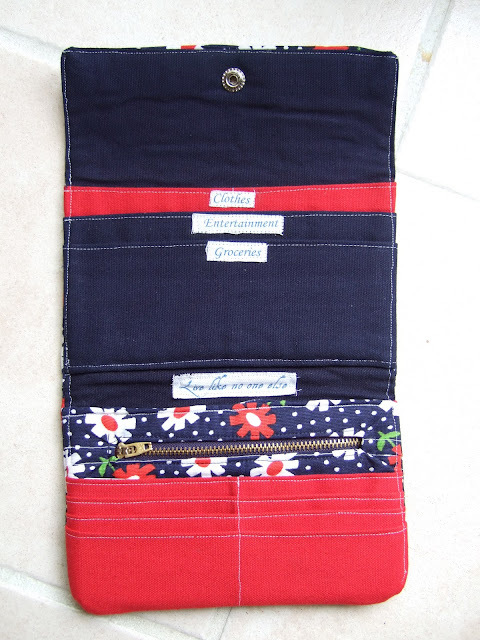 And speaking of pockets - I LOVE purses with lots of pockets - yours certainly fits the bill - love it!!! That is so cute! I just love the piping on the skirt with the pocket shape and button.the higher waist on vintage patterns are also thinning I think. Anyway you have a cute figure.. I think a white Peter pan blouse in a cotton voile would be cute. They had a lot of sleeveless blouses this would be cute with. You look simply precious, my dear! Brilliant. Love the different labelled sections of the wallet! This looks great Gina and the photos again are so well taken, need to show my husband this so he can improve when I model my outfits. The material choice is so sweet, love it. I went into my stash of vintage trims and found black piping. I thought I would have to buy some but there it was. Will be using it on a Chinese type top with frogs. It said $.19 cents. Your package will be dropped off at the PO today. Oh goodness LOVE LOVE LOVE your skirt! ;o) I am going upstairs to wash my fabric so I can get going on mine!! This is just perfect! I would totally buy that in a store. 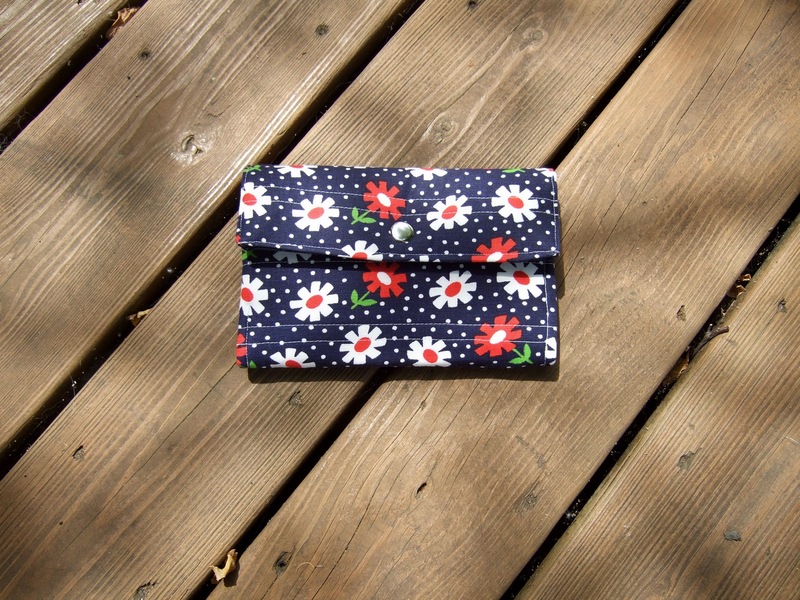 Cute fabric and great pockets. So perfect. The details and the fit are wonderful. No problem areas in this skirt. I don't know what kind of shirt pattern would go best with your skirt, but I like the idea of using green as you have done in these pictures. Oh I love it! those pockets are just perfect! I came by via sew retro and I love you blog. Have a happy day. You look great as always. I really love that wallet. How helpful the way you have it labeled. The colours and the trims are so cheerful - I love the white buttons! Thanks, I am going to enjoy wearing this skirt as the weather gets warmer. I am told it will get warmer. Smiles to all of you! I simply LOVE the pattern of the skirt and the matching wallet. They are too cute! I kind of like the green blouse/top with this skirt. Yes, it's kind of casual (I'm a "casual girl" myself), but it's still nice. It's a very refreshing outfit. Ohh! Beautiful! You got a suit with the skirt and the top very light and spring, also ... I envy your waist, my God! Nice, love all the bright color. Both pieces turned out beautifully and fun.Thanks for sharing.